Before Christmas we were sitting around with family discussing gingerbread houses – TB has made a few over the years. 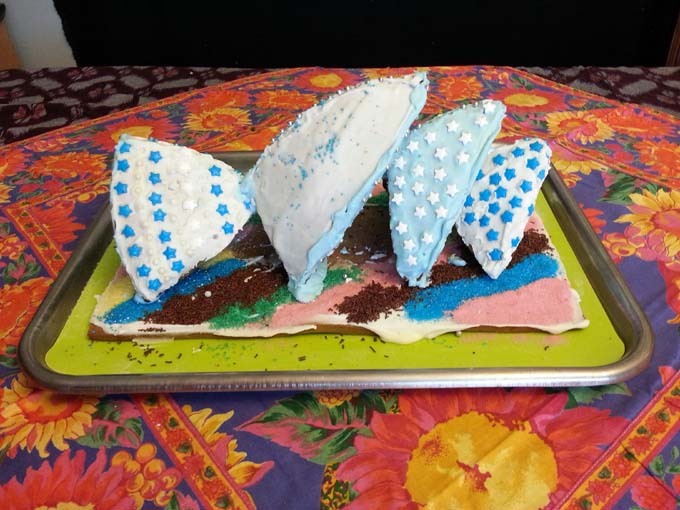 We decided to see what was on the net and not surprisingly many searches led to this gingerbread re-creation of Saint Basil’s Cathedral in Moscow. OK, so we weren’t going quite there. Instead TB decided to make a reproduction of Australia’s most famous ‘house’, the Sydney Opera House, which celebrated its 40th anniversary this year. (Even though we have Parliament House here in Canberra, we thought it was a bit boring). 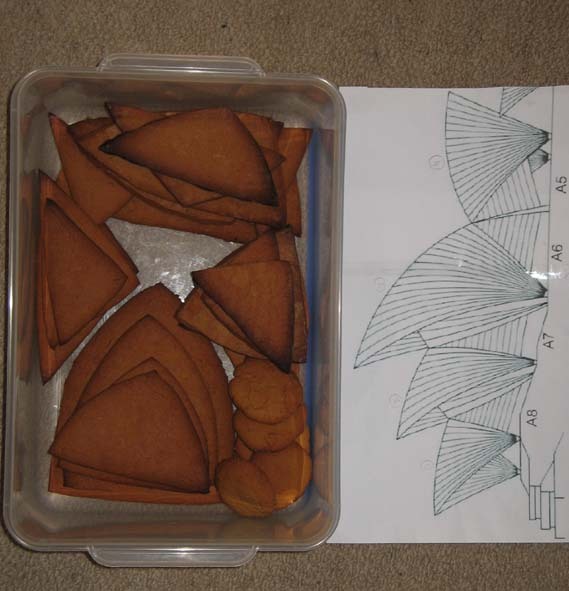 It was easy enough to find a schematic drawing of the Opera House, but making the curved shapes required finding a bowl that could go into the oven to make the ‘shell’ sections. Cooked ‘shells’ and schematic drawings. TB simplified his construction focussing on making only the four main ‘shells’ and not the fiddly bits in between. 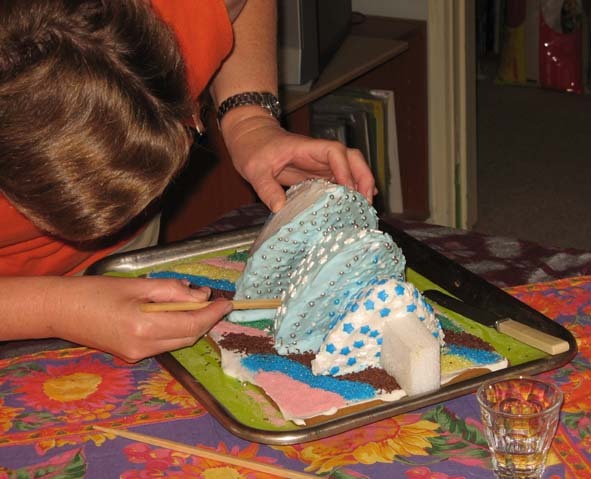 Then came construction with the help of a lot of icing mix. 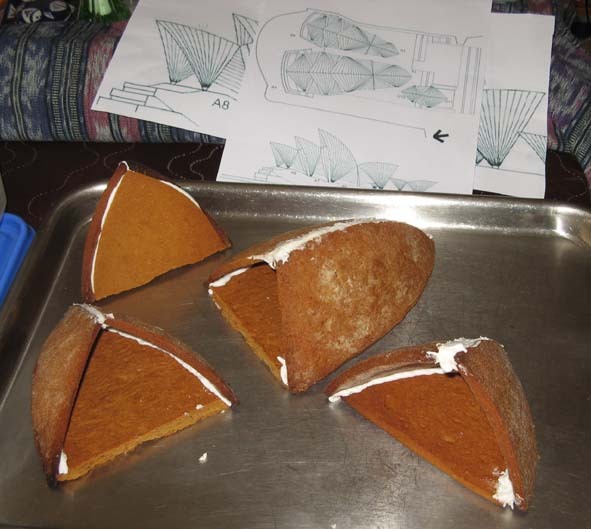 Gingerbread Opera House shells held together with icing. We got a bit carried away when it came to the icing, we found far too much glitter and shiny stuff in the cake decorating aisle of the supermarket. Sticking the decorated bits of the Opera House together proved challenging. At last – 2 kilos of gingerbread mix and 1 kilo of icing later and we were done! We had a very positive response from the friends we had Christmas lunch with. We managed to get it to their house with only some one little break – unlike what was left over after lunch. 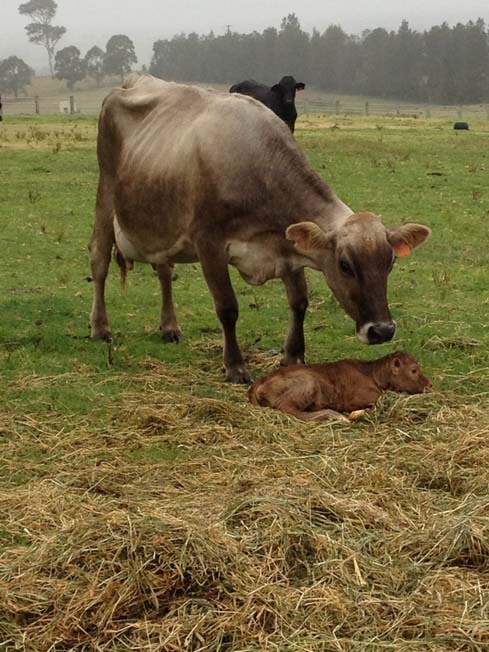 Arrived Christmas Eve, Nigella, a new girl calf for Snowy, my sister’s Brown Swiss cow. Snowy with Nigella, born Christmas Eve 2013. 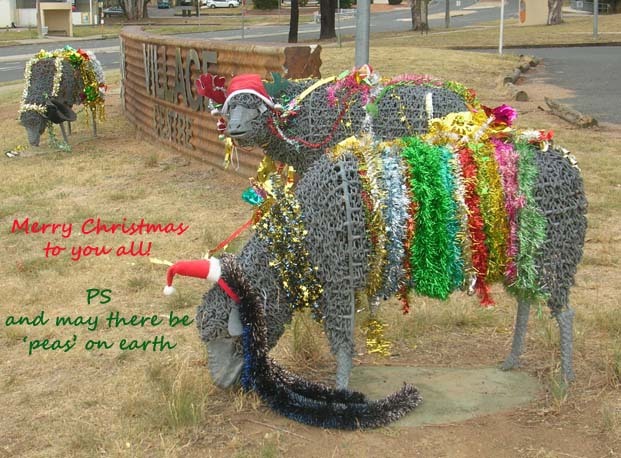 Yes, it’s what you’ve been waiting for, the 2013 photos of the decorated Kambah Sheep! 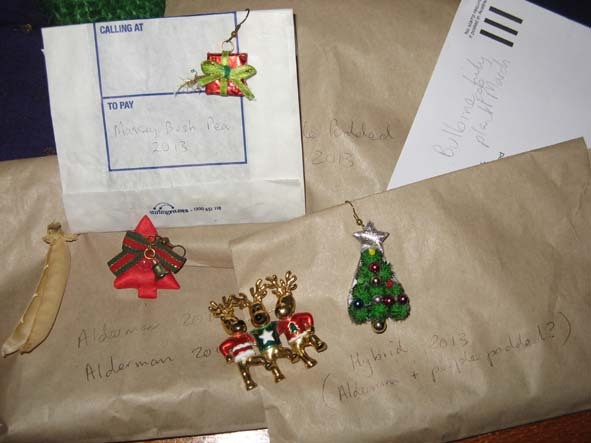 Dazed and confused – a severe case of tinsel overload! Yes just a week to go and we’ll all be eating way to much food and enjoying ripping paper off presents. This year I decided to make some presents for my family, small family of knitted and felted Christmas trees. I used up some balls of mohair and small bits of handspun yarn that I had in my stash. The pattern came from Mason-Dixon Knitting Outside the Lines. I was well pleased with the result. 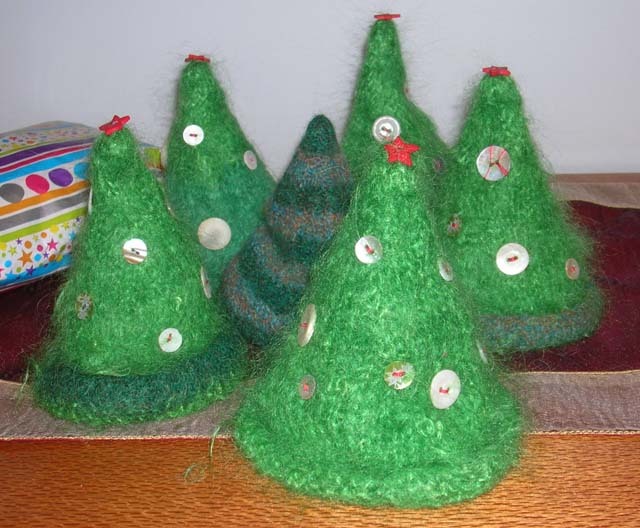 A small family of knitted and felted Christmas trees. 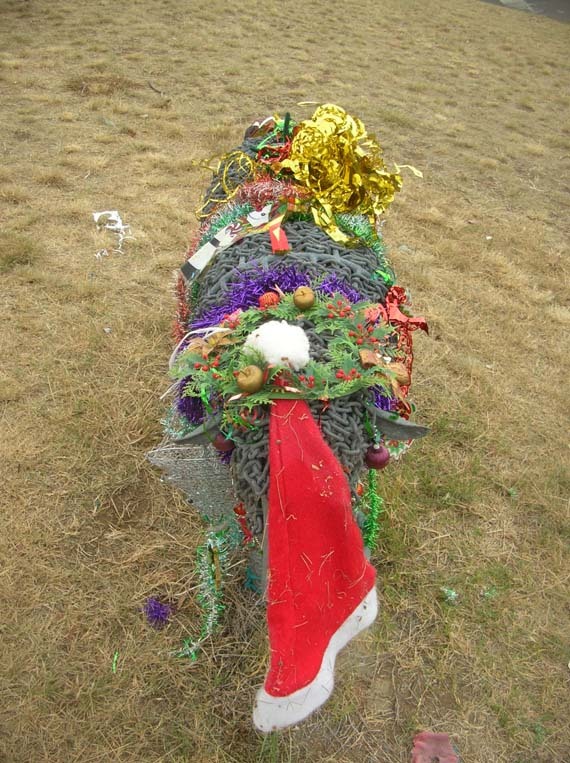 In the lead up to Christmas its all ‘go’ as we change over our crops. The tomatoes are in, the beans have replaced the peas and the carrots have been selectively weeded to remove those going to seed. We are working hard to get all the seedlings out of the polyhouse and into the garden beds. We like to collect seed from our old crops as while we are pulling out the old plants. It is a gift that keeps on giving. After 5 years of veggie gardening the bulk of our regular crops are grown from seed that we or our other gardening friends have saved. A range of our peas and some Bulbine Lily seeds, ready for the next season. 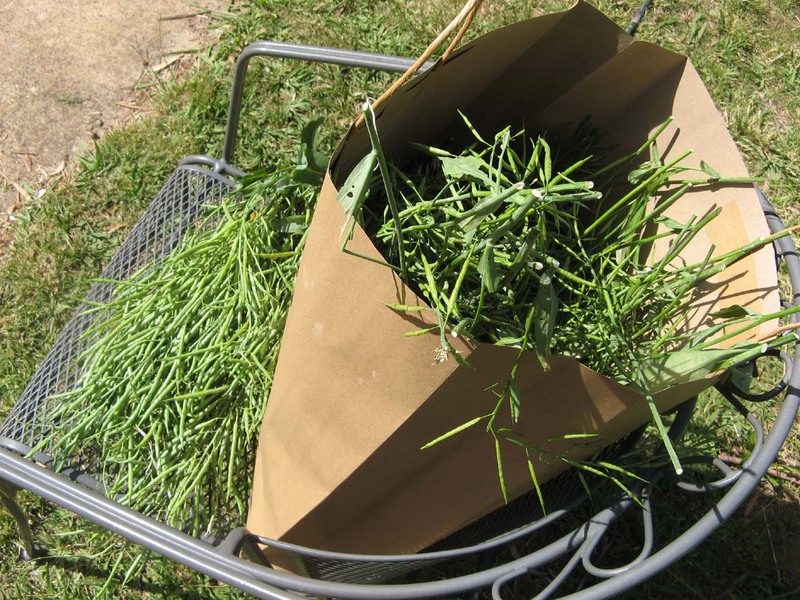 Stripping the seed from our Red Mustard plants (Brassica juncea) turned out to be an unexpected pleasure. The seed pods are divided in two by a fine membrane. As you split the pods the outer parts fall away leaving the membrane attached to the stem. 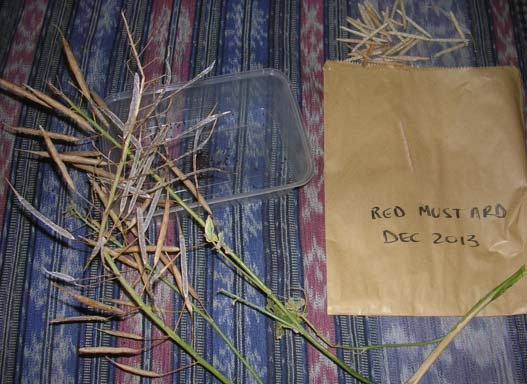 A partially stripped stem of Red Mustard. The full pods are to the left and the membranes are to the right in the picture. Then I had one of those ‘duh!’ moments – I was stripping mustard seeds! Just how many mustard seeds do I need for replanting? A quick search of the interweb revealed that apart from eating the leaves, which is what we grow them for, this type of mustard can be used for making mustard oil and is also known as ‘brown’ mustard. Home made mustard anyone? Bulk mustard seeds and some kale seeds, to be dryed for mustard seed. We figure we should get a small jar of seeds from this lot. At least enough for us to get a reasonable sample of mustard. We’ll let you know how it turns out. The day has come when we have finally let our chickens roam freely around our back yard. We have finally clipped their wings so they couldn’t readily fly over our fences. Now before you get upset on behalf of the ‘girls’ wing clipping is far less drastic than it sounds. There are no nerves or blood vessels in the tips of a chicken’s wing and all you need to do is cut off about 8 cm of the tips of the flight feathers on one wing. The idea is they can still fly up if threatened but they can’t fly far because they will be off balance. Anyway having carried out this minor operation the girls are now free to get out into the garden. 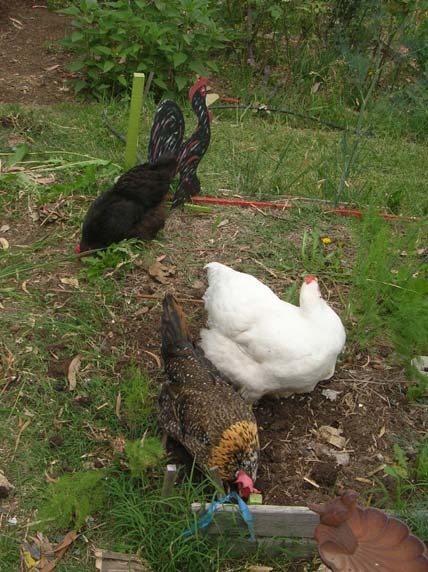 Here they are helping to rotovate part of our auxilliary asparagus patch. We still have to be in the yard while they are out because our garden isn’t completely fenced in. So far they haven’t eaten anything they shouldn’t and they are having lots of fun finding all sorts of grubs to gobble. 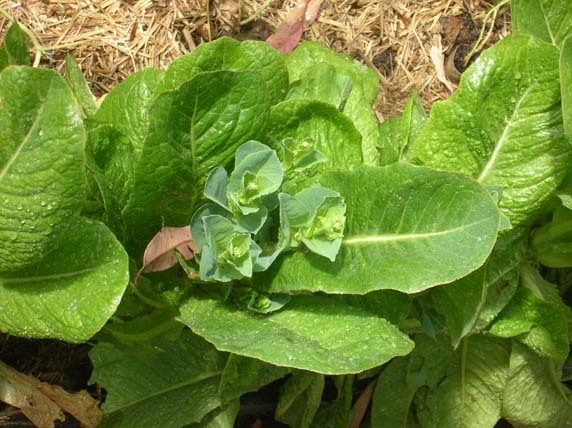 While I was poking around the garden I noticed that where we had pulled the top out of our cos lettuce plants to feed to the chooks the lettuce plants had started re-shooting. It will be a week or so before we find out whether the new leaves can be eaten or are so bitter that we can only feed them to the chooks.